Hello! My name is Amy Starr, owner of events with a. starr. For as long as I can remember, I have been MADLY in love with all things party! I’m always finding an excuse to plan one and host multiple personal parties each year. You could say, I know how much time, energy and resources are spent to create a fabulous time! You can also say, I know first hand how stressful, overwhelming and time-consuming planning can be. My first real-wedding experience was in 2013 for my sister and her now husband. I was part coordinator/manager and part maid-of-honor. In 2014, my best good friend (Forrest Gump reference here!) was getting married and saw myself again as part maid-of-honor and wedding coordinator/manager. In Oct 2017 I was asked to be the wedding manager for a friend's daughters' wedding. 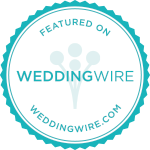 These experiences showed me there is a true need for brides and grooms (and their families!). I thought, if I can offer services to help make THEIR lives more enjoyable through the planning process, they will love the experience and their day! Thus, events with a. starr was established! A quick bustle to get this bride on her way! In the early 2000's I found myself in a very unique position at a large retail company as the Community Event Coordinator. Through this job I was exposed to, and gained experience with, planning and managing events, networking with high-profile city public figures and public speaking and presentations. Over the past decade, I have been employed by a highly regarded CT-based Insurance Company where I’ve held positions as a team-leader, trainer, mentor and customer service representative. It’s with these job experiences I am able to bring the skills needed to ensure your flawless day! On the move…it’s go, go, go time! Known as “The Hustler”, Melanie arrives on the scene ready to get the job done! Whether it’s setting up your tables, or running to fetch your wedding party for pictures, she’s on the move to make certain your day goes without a hitch! Gayle has an eye for design, which is ideal for making your day look beautiful! She has a knack for seeing the potential to make something out of nothing. With a heart of gold, Krystal brings joy and lasting memories to whomever she meets! You can often catch her in conversation with a guest (or yourself! ), completely intrigued and enthralled in the topic. Her ability to make others feel at ease in the most stressful of times makes her a great addition to the team!